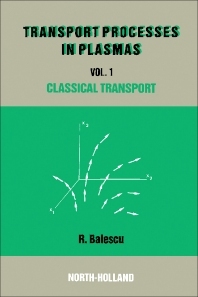 Transport Processes in Plasmas, Vol. 1: Classical Transport Theory focuses on problems on the transport of matter, pressure and velocity gradients combined with external electric, magnetic fields, and momentum and energy in a plasma submitted to temperature. The publication first ponders on the motion of a charged particle in an electromagnetic field and microscopic description of a plasma. Discussions focus on Liouville equation for independent particles in stationary external fields, Landau kinetic equation, conservation properties of the collision term, motion of a charged particle in simple electromagnetic fields, drift approximation, and Hamiltonian mechanics. The text then examines the macroscopic description of a plasma and Hermitian moment representation. Topics include local plasma equilibrium state, classification of the moments, local distribution functions, macroscopic quantities of a plasma, equations of evolution of the macroscopic quantities, and entropy balance. The manuscript reviews magnetohydrodynamics, entropy and transport, and classical transport theory. Concerns include linear transport regime, classical transport coefficients, entropy and Hermitian moments, transport form of the entropy production, and resistive magnetohydrodynamics. The book is a valuable source of data for researchers interested in the classical transport theory.